I implemented some shell scripts to my dolphin context menue. Within the shells scripts i run some commands, which take some time. 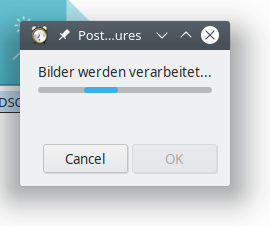 My question is: Is it possible to implement some code into the (a) shell script, so that a pop up window or a status bar in the notification field (kde plasma) is showing up? mogrify -unsharp 0.25x0.25+8+0.065 -resize 1280x1024 -normalize -density 180 -monitor "$i"
Answer to my question is working but not the most beautiful one ;) It lacks the continuous progress bar in percentage. This will open a window with the pulsating bar. The window is open as long as the commands are still working. Not the answer you're looking for? Browse other questions tagged scripts notification notification-area or ask your own question. How to make a progress bar work in Zenity? Indicator Menu Replacement for notification area? Kill the notification area so I can use the awn-notification-area? What program currently handles the old notification area? How to enable the Update notification in the Unity notification area? How to remove Universal Access from the Notification Area? How can I get rid of the “En” icon in the notification area?